With Ramadan gracing us with its presence, one cannot deny the very culinary experiences that remind us of a part of this holy month. 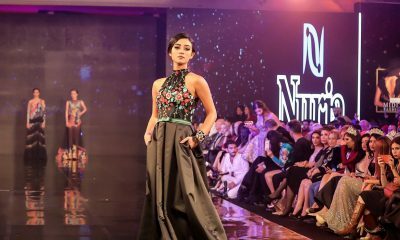 Ramadan, a month of worship and giving, is also a month full of flavour and wondrous gastronomic experiences. From sweet honey syrups and pistachio flavoured ice creams, to crust-less pumpkin pies, Ramadan truly knows how to excite our taste buds. Here’s a sample of Ramadan’s most delectable sweets. 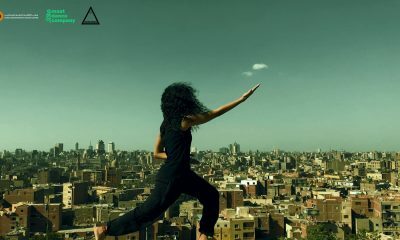 Umm Ali, Egyptian sweet pastry pudding. Umm Ali, literally the mother of Ali, is perhaps one of Egypt’s most favored desserts. Easy-to-make and economical, Umm Ali dates back to the Ayyubid dynasty. A purely Egyptian dessert, it is said that Umm Ali came about after the wife of Ezz El-Din Aybek, the ruler of Egypt at the time, Shagaret El Dorr ordered for her rival Umm Ali to be killed upon the death of her husband. 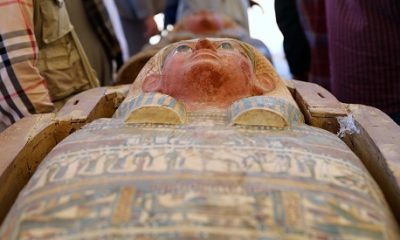 After the death of Umm Ali, to celebrate, Shagaret el Dorr requested that her cooks create the most delicious dessert ever made and to distribute it throughout Egypt. This Egyptian dessert staple is made of phyllo pastry, milk, double cream, nuts and is sometimes topped with raisins, powdered sugar and coconut flakes. 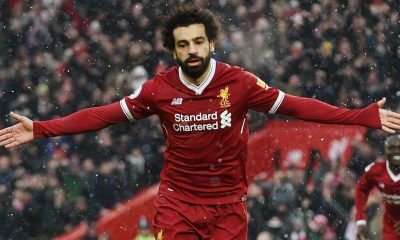 Basbousa in Egyptian (but Hereessa in Alexandria), Revani in Turkey or Namoura in Syrian, this delicious well known dish can be found in the east of Middle East. 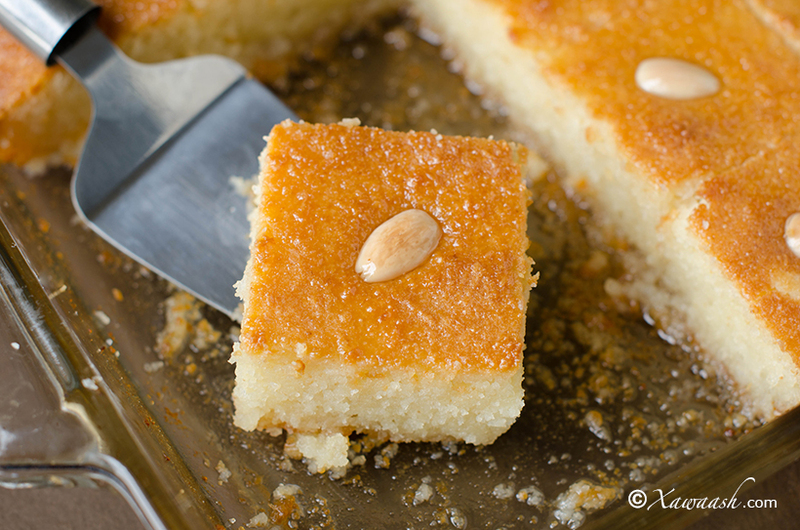 A sweet cake made of semolina, same wheat used in pasta and couscous, soaked in simple sweet syrup; sometimes the syrup is flavoured with coconut or rose water. Basbousa can be eaten with nuts, heavy cream or plain. Middle Eastern Kunafeh topped with pistachios. Sweet, rich, crunchy and creamy, Kunafeh or Knafeh can be found in regions that used to be occupied by the Ottoman Empire. This sweet pastry is the Middle Eastern version of the cheese cake. 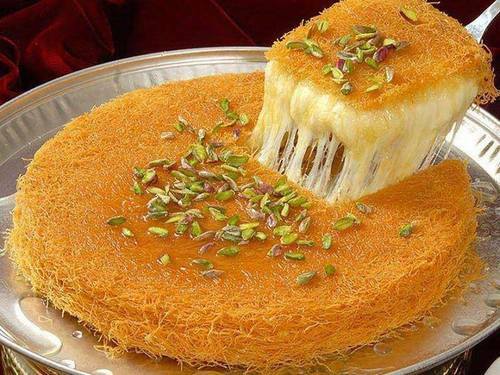 Kunafeh is made of semolina dough and thin noodle-like phyllo pastry. It is stuffed with a white soft cheese such as Nabulsi cheese. Kunafeh is crunchy on the outside and is soaked in simple sweet syrup. Recently, the Middle East has seen variations of this dish with the addition of Mangoes. 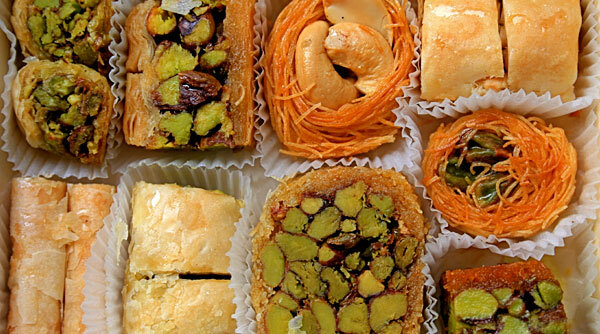 Like many Middle Eastern dishes, baklava is said to have developed during the Ottoman Empire. 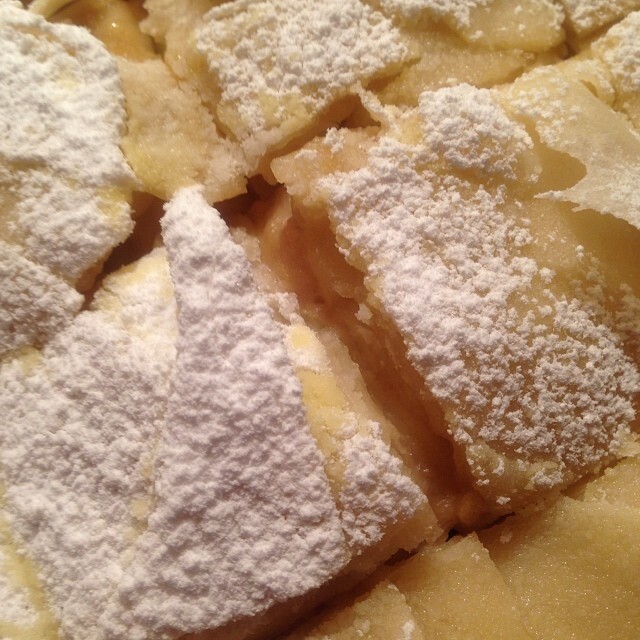 However, this tasty dessert can be found in Albania, Bulgaria, Greece, Armenia, Azerbaijan, Cyprus and Georgia too. Another popular sweet phyllo pastry made of several layers of phyllo, chopped nuts and drizzled with sweet syrup or honey. 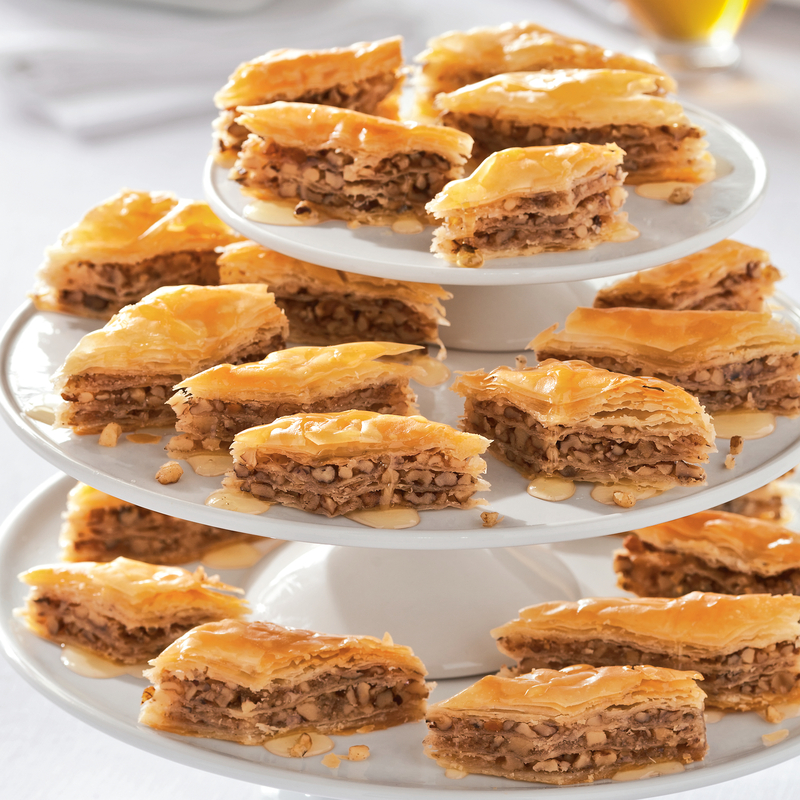 Baklava is a crunchy pastry that is usually served in small gateaux sizes. Aish El Saraya topped with pistachio. 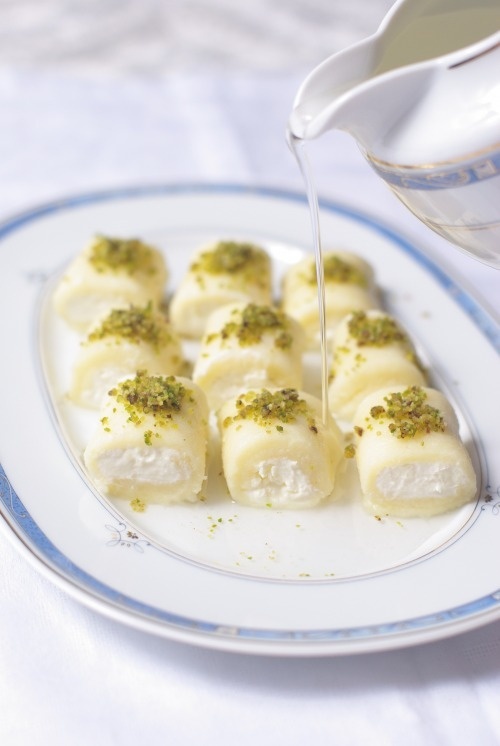 Literally the bread of the royal palace, Aish El-Saraya is a delectable dessert eaten in special occasions. The origin of this dish is unknown, yet some have attributed this dish to the Lebanese cuisine. It is sweetened bread and often drizzled with very sweet syrup and covered with cream on top. Sometimes, Aish El-Saraya is garnished with nuts. Those three pastries are made of deeply fried dough and are eaten with honey, powdered sugar or sweet syrup. It is said that Zainab fingers date back to 100 years when a woman called Zainab made this beautiful dish. 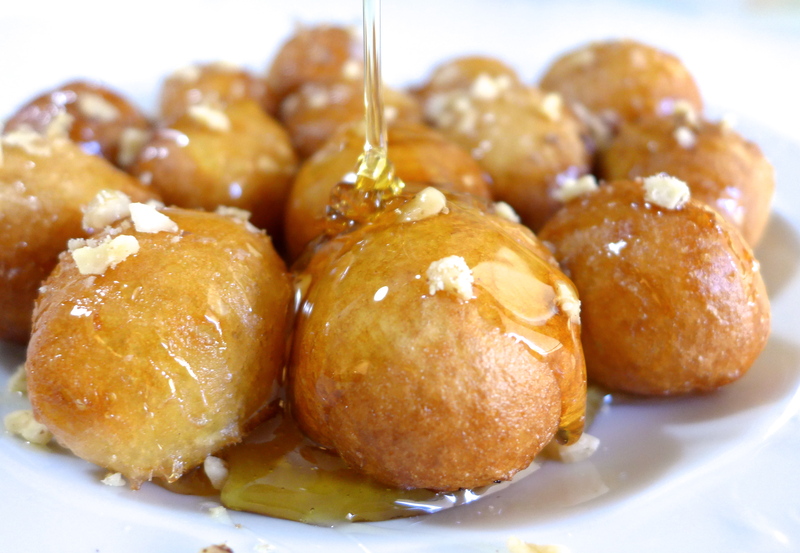 Balah El Sham means dates of the Levant area and Luqumat El Qadi, literally the food of the Judges, is sometimes called Loukoumades. 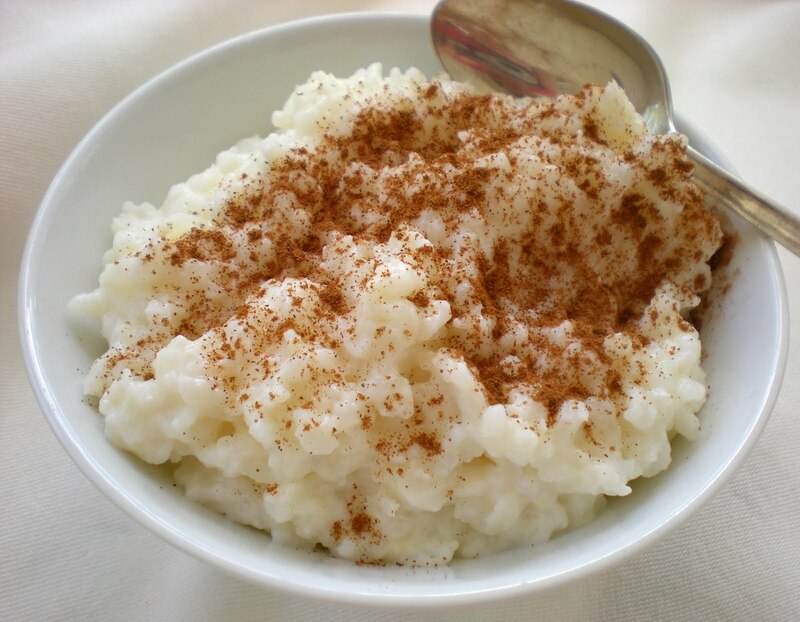 Delicious rice pudding garnished with cinnamon. 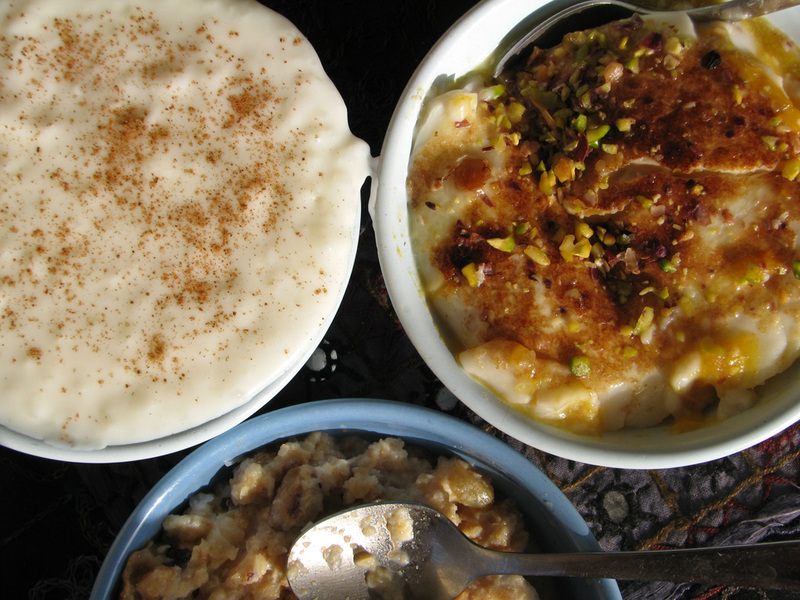 Rice pudding, roz bel laban in Arabic, can be found in many cuisines. It is said that rice pudding originated in the Middle East in medical texts rather than cook books. It has long been associated with good nutrition and good digestion. It was often recommended to people of all ages for stomach illness. This appetizing easy to make dish is made of a mixture of rice and milk. It is sweetened with the addition of sugar and can be topped with nuts and garnished with cinnamon. 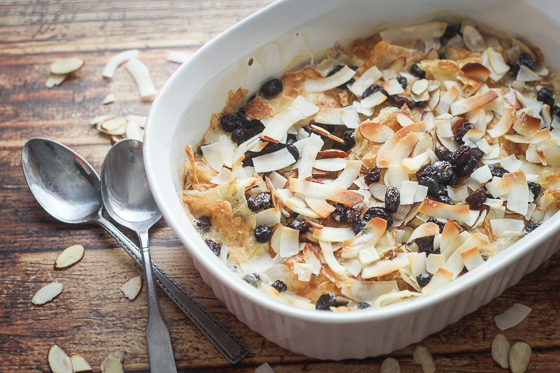 Recently, variations of this dish include eaten rice pudding with ice cream. Qatayef is an Arab dessert commonly eaten during Ramadan. It is said that Qatayef is of Fatimid origin. Qatayef is sweet a dumpling often filled with Akkawi cheese, or any unsalted cheese. It can also be filled with nuts. It is commonly fried, yet, some cultures bake it. 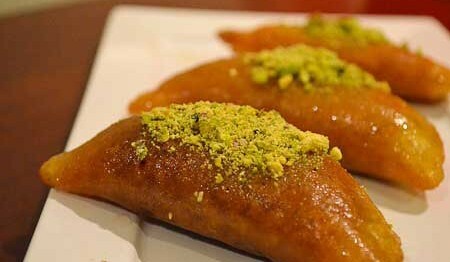 Qatayef are drizzled with honey, sweet sugar syrup or powdered sugar. Sweet feteer topped with powdered sugar. 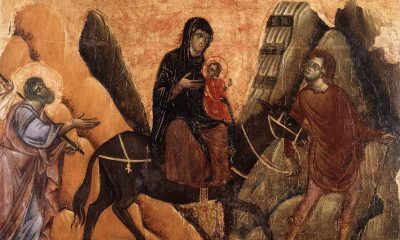 Feteer or Feteer Meshaltet is originally known as feteer maltout. 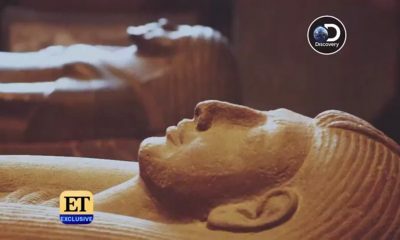 In Ancient Egypt, Egyptians served feteer as an offering to the gods. 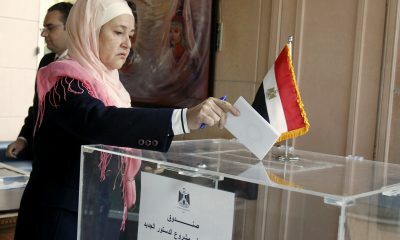 It has since become a popular pastry among Egyptians and the Middle East. In its original form feteer is baked in an earth oven (pizza oven) and is baked in huge quantities. The plain feteer pastry can be eaten with honey, cheese, jam, sugar, molasses and many other options. However, variations of this pastry have included different ingredient and toppings. 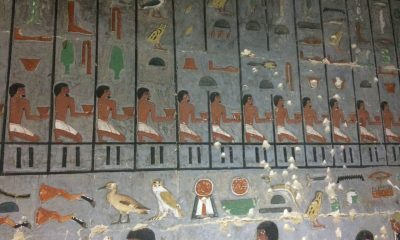 Today, feteer can be eaten with all kinds of meat and all kinds of dessert additions such as custard. Halawat Al Jibn with syrup poured over and garnished with pistachio. Halawat el Jibn, meaning the sweetness of cheese, is a very popular Lebanese dish. This dish is made of a thin layer of phyllo pastry rolled with cheese and a custard like heavy cream. A finger-licking dish, halawat el jibn is a cheese dessert drizzled with either rose water or a sweet simple syrup. It is often garnished with nuts, especially pistachios and can be topped with cherries. Ghorayeba stacked on plate ready for serving. Kahk, a thick circular pastry, is often soaked with powdered sugar. 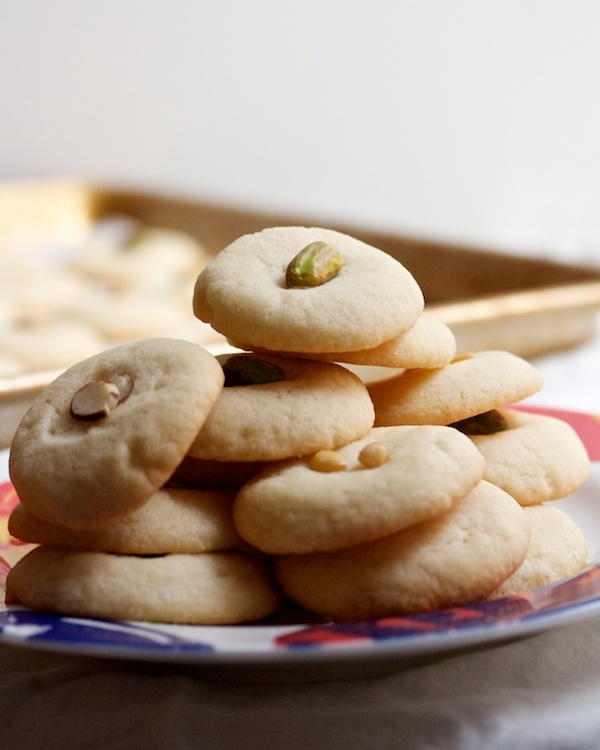 While, Ghorayeba is most commonly known as butter biscuits that melt in your mouth as soon as you eat them. Some of those delicious cookies are filled with cream, custard or sweetened date pudding. Maamool is usually filled with date pudding. Layali Lubnan topped with strawberry and banana slices. Layali Lubnan, meaning Lebanese nights, is a Lebanese semolina pudding often flavored with orange blossom, rose and vanilla. 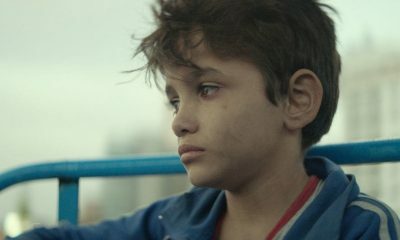 A simple syrup often used in Basbousa and Qatayef is poured on top. 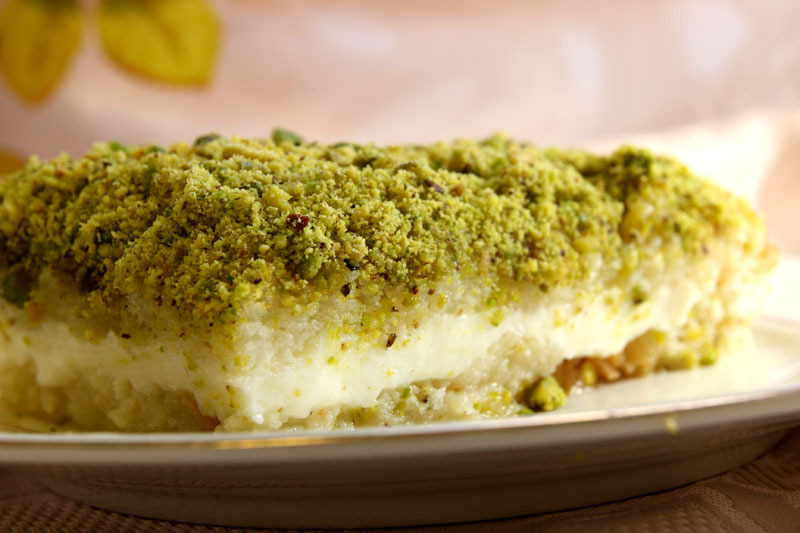 Layali Lubnan is topped with a thick layer of whipped cream and crunchy pistachios. It can be garnished with fruits such as cherries and strawberries. Halva with nuts sliced into rectangular pieces ready for serving. Halva or Halaweh is a Middle East staple. Made from sesame seed paste, this deliciously sweet confection has spread to various cultures. Most commonly, Halva is made of sweetened sesame seed paste. Halva can be eaten in many ways. It is often spread on bread and eaten for breakfast. 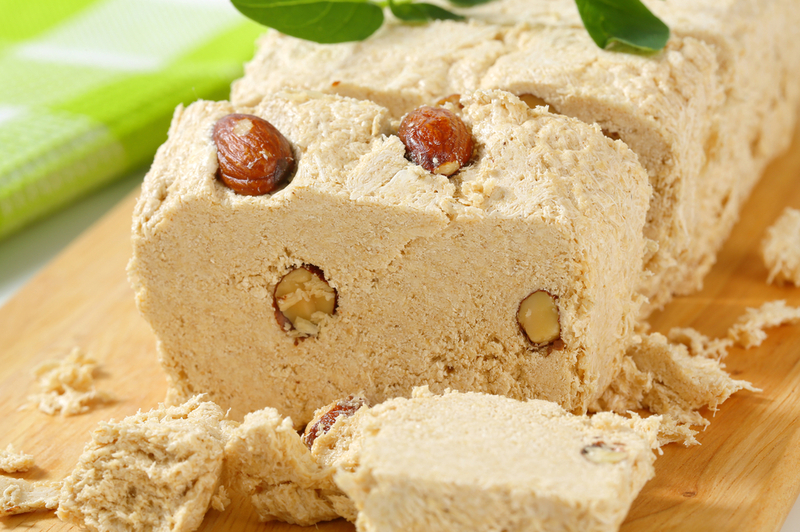 It is said that Halva is beneficial to the reproductive organs and for women who breastfeed. Turkish delight covered in powdered sugar. 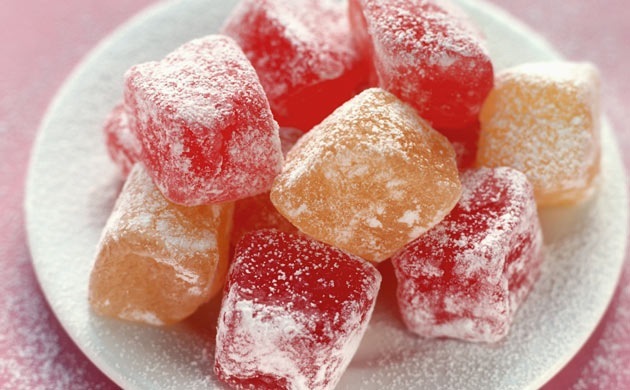 Turkish delight is a family of confections that originated in Turkey. 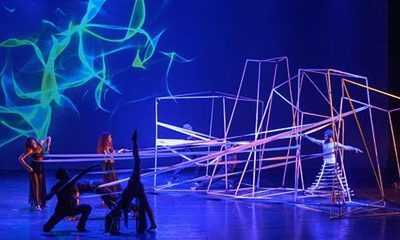 It is made of gel based on starch and sugar. Originally this dish was sweetened with honey and molasses. Turkish delights are a Middle Eastern favourite and come in all colours. They are especially sweet and covered in silky powdered sugar. They are often flavoured with rose water, orange blossom, lemon or mastic. Qara’ ‘Asaly with Umm Ali and rice pudding. Qara’ ‘Asali is a middle eastern pumpkin pie. It is not clear where this dessert originated. Unlike pumpkin pies, this one is very different because it doesn’t contain elements of a pie. It is a mixture of pumpkin, butter, milk, flour and sugar. This pumpkin delight is baked to total sweetness. This pie has no crust. It is sometimes eaten with heavy cream and garnished with pistachios. 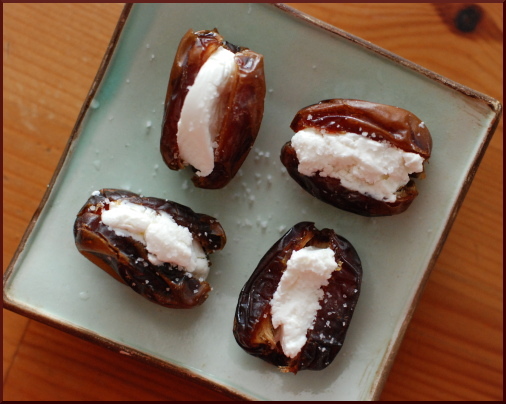 Sweet dates stuffed with goat cheese. A staple among Middle Eastern desserts, dates are often eaten in Futur during Ramadan or Suhur. 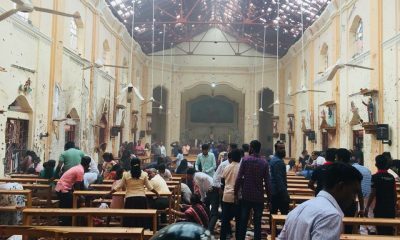 It is also eaten to break the fast of Muslims. Dates are religiously affiliated and are often eaten as a ‘sunnah’ to the Prophet Mohamed. Scrumptious and very sweet, sweetened dates are often called “Tamr.” They can be eaten plain or can be stuffed with goat cheese and nuts. Fakhfakhina fruit salad topped with ice cream. 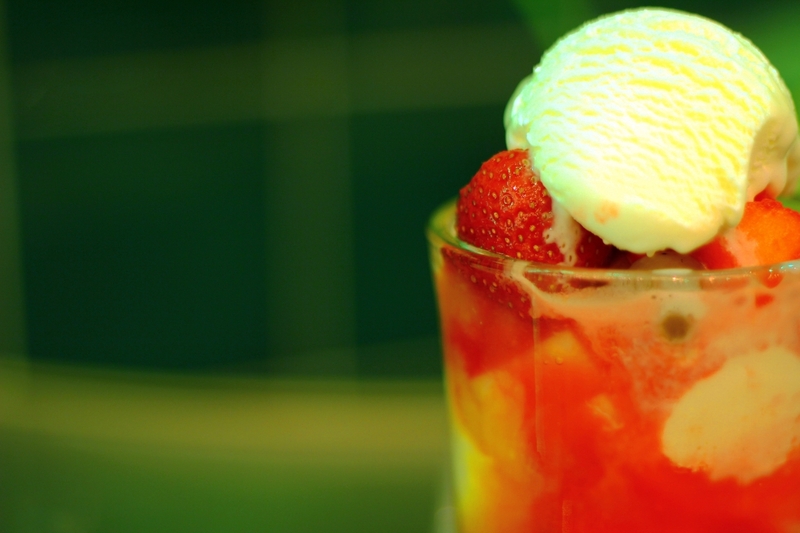 This fruit salad includes seasonal fruits, juice cocktails and ice cream! Beautifully blended fruit flavours all add to the glory of this dish. 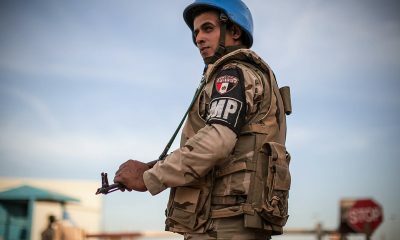 Today, the Middle East makes water pipes flavoured with fakhfakhina. Originally Persian, Bastani is a Middle Eastern ice cream. 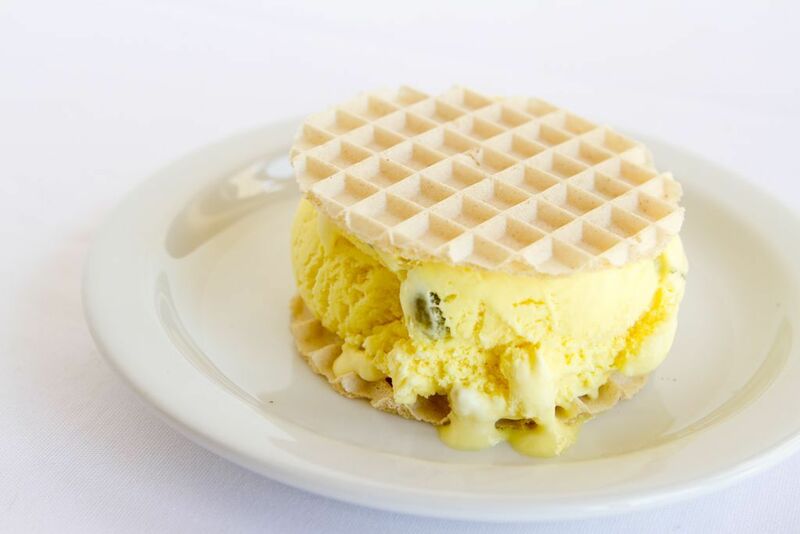 Made from eggs, sugar, rosewater, vanilla, pistachio, milk and saffron, bastani has a sorbet feel. 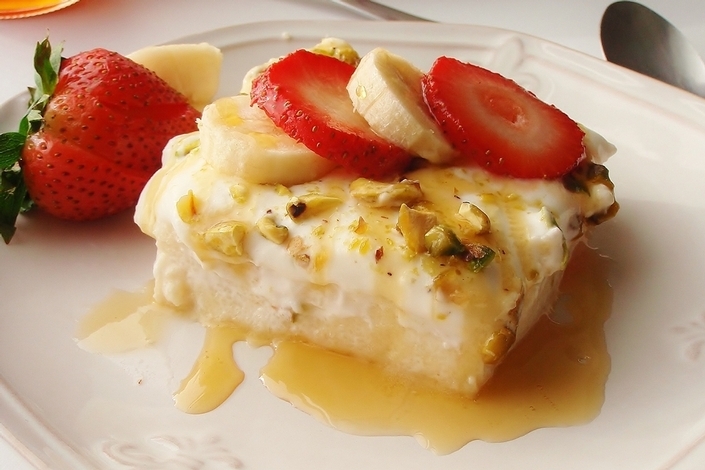 During the Persian empire, this dish was sweetened with honey and chilled in snow. 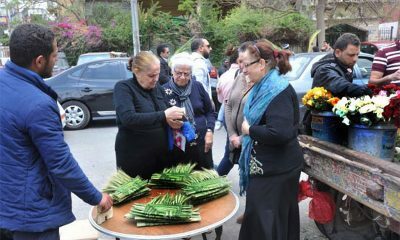 Mshabak is a Lebanese sweet often eaten during Ramadan or the Virgin Mary’s day. 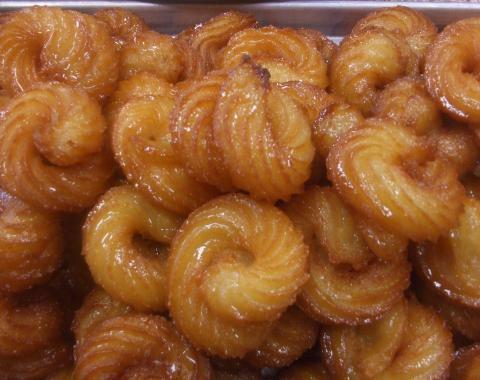 Mshabak is another fried dough dish shaped in interesting circular shapes. It is soaked in sweet syrup.